NYSME was originally organized in 1926 in New York City. In its early years, the organization moved to and from various locations throughout Manhattan. In the early 1940’s, the organization moved to the Lackawanna’s Hoboken Terminal. However, during the mid-1950’s the organization moved to its current location in Carlstadt, NJ. At our present location, our organization features two operating model railroad displays. 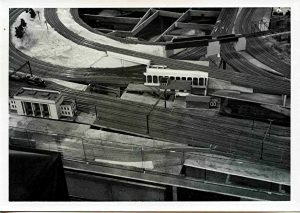 One railroad, The Union Connecting, models two rail O-Scale (1/4″ to the foot) The other railroad, The Union, Hoboken, and Overland, models HO scale (1/8″ to the foot). NYSME holds two public exhibitions of the layouts around Christmas time and in the early spring. However the society does hold a work session every Wednesday night starting around 7 p.m. Visitors are welcome to come by but there is no guarantee that any trains will be operating. 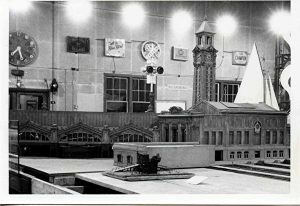 Before there was an N.M.R.A., Model Railroader, or Walthers, there was the New York Society of Model Engineers. The Society was incorporated in 1926 and is known to be the oldest society in the United States. The members of the New York Society of Model Engineers will be celebrating their 90th anniversary in 2016. Our past membership reads like the Who’s Who in model railroading…. Alexander, Ickens, Vanderbilt, Walthers. The first president and four founding members of the NMRA. Five authors of articles in the first edition of Model Railroader. John J Astor was also notable past member to have graced the society history. 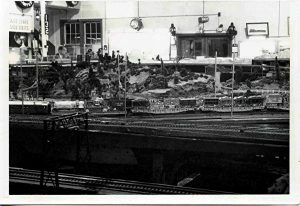 The society set model railroading standards, which were eventually adopted by the NMRA, and became the basic standards for the hobby in all the scales. The Society was the first to organize and hold contests, setting the criteria for others. 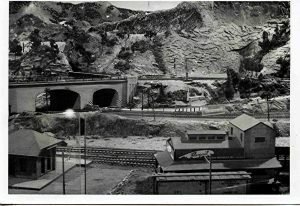 Famous builders, manufacturers and authors of articles on how to design and build model railroads have been included in our society’s membership. The NYSME has had many different modeling divisions over the years. The first president of the Society built maritime models, which for the longest time was our largest division. We even sponsored boat races in Central Park. There were also divisions for stationary steam engines, trolleys, boats, live steam engines, gas powered racecars, airplanes, and of course trains, in multiple scales. The Society has called many places home and it has been said that we have been dispossessed more times than any other group! We started on the 8th floor of the Knickerbocker Building in New York City, and then were moved to the basement. Next we moved to 34th Street. After that the Science Building on 32nd Street. We were evicted again and at that point the Society got lucky. The Lackawanna Railroad discontinued some of their ferry service after World War II, and we were able to secure the upper ferry concourse at the Hoboken Terminal. At this site we built the largest model railroad in the world at that time. In 1958, the Society was evicted again, this time by the United States Postal Service. The concourse was going to serve as a mail sorting area. But after the railroads were dismantled, the USPS decided to let the airlines handle first class mail. The concourse was never occupied and we were invited to move back. By that time, however, we had purchased our own building and moved to our current location in Carlstadt, NJ. 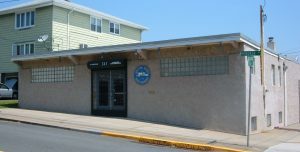 The building in Carlstadt was renovated and made ready for housing a model railroad society. A workshop was built for the membership which included lathes, milling machines, drill presses, band saws, a table saw, and a spray booth. We also began a library, to archive model railroading and railroads. And we also began two new layouts, one in O scale the other in HO. The HO railroad is known as the Union, Hoboken, and Overland. The railroad went through three revisions and was totally ripped out in 1985. The new railroad is designed to be a walk around layout. There is a two track mainline with a branch line that has plenty of industries to be serviced. A large freight yard was also constructed and includes an operating hump yard for sorting out cars. All track is hand laid with code 83 rail on wooden ties. There are 237 switches all powered by Tortoise motors. Overall the railroad is about 5.5 scale miles. Our most recent improvements to the UH & O include a prototypical signaling system, the addition of digital control system (DCC) for the entire railroad and installation of an interlocking connecting the main line, branch and flat yard. The O Scale railroad is known as the Union Connecting. Its design is based on the Erie Railroad between Jersey City and Port Jervis. The railroad features a 4 four-track main line, which splits and comes back together at Ridgewood Junction. The layout has two passing sidings, a large freight and coach yard, a branch line, and an operating trolley system. Track on the O scale layout is also hand laid; there are also 28 double slip switches, 200 turnouts, and over 17 scale miles of track. Current projects on the railroad include a replacement of all control panels, installation of a signaling system, improving scenery, replacing the trolley system overhead wire, and expansion of the Port Jervis yard. Our membership is proud of our past performances but we are constantly looking to the future, learning new skills and growing in our hobby. If you are interested in becoming a member please view our membership page.